I hope your weekend was a blast. I had my wisdom teeth out on Friday, so my life has been consumed by ice packs, heat packs, pudding, milkshakes, smoothies, applesauce, and movies. I’m ready for some solid food. Just looking at this recipe right now is making me hungry. 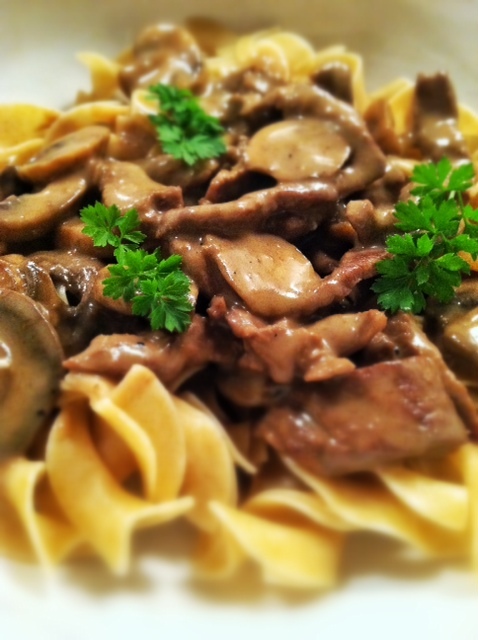 Beef Stroganoff has Russian origins and although I am not Russian, it was a childhood favorite of mine growing up. Sirloin filet makes it a continued favorite at my house. Back in the day I am pretty sure it was often made with skirt steak or ground beef (?) and canned mushrooms but we’ve kicked those guys out to keep it fresh and delicious. It’s still comforting though! You start out with all your ingredients. Saute the steak (that has been sprinkled with flour) on high heat. 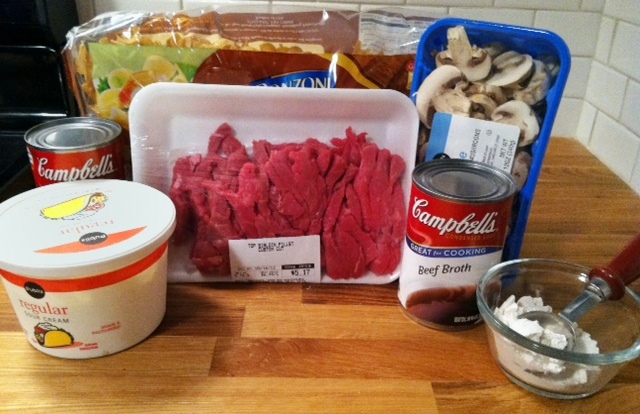 Simmer the steak with fresh mushrooms and beef broth. In a small bowl, to thicken up the sauce, you are going to make a slurry with a bit of the broth and flour. 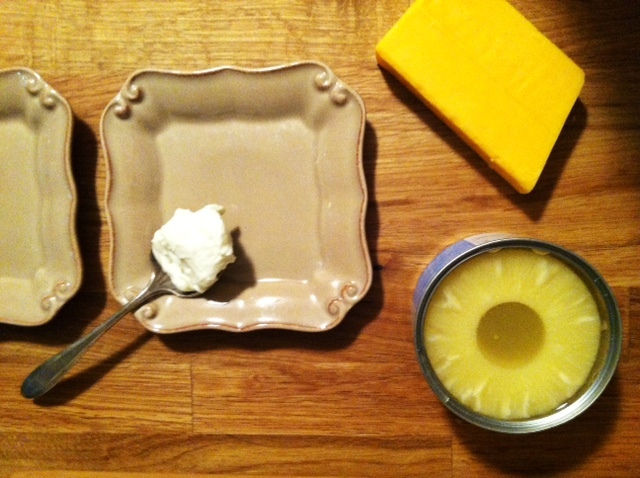 When you add this back to the pan it will get thick and creamy. Then the addition of sour cream will finish it off. 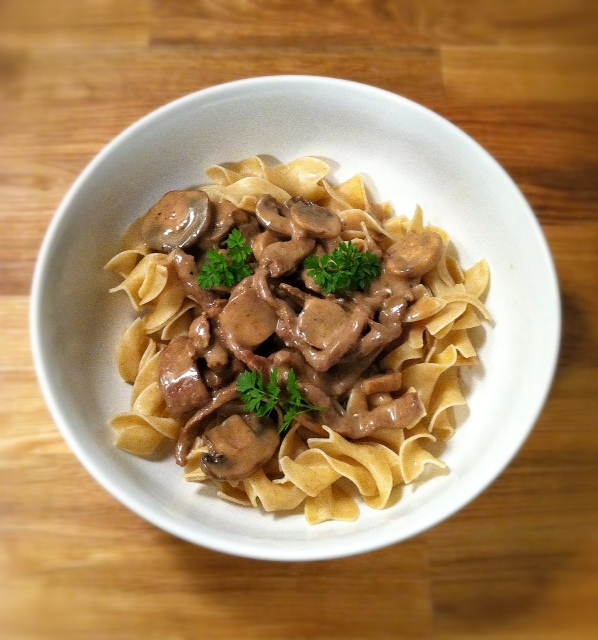 I have always served my Beef Stroganoff with what some people call a “weird salad”. It’s really just pineapple rings with two small dollops of mayo and some grated sharp cheddar. Has anyone else ever tried this? I swear it is good. Though, it may take some getting used to. Sprinkle sirloin with 1 tablespoon flour and 10 grinds of fresh pepper. In a large nonstick skillet, heat oil over medium high heat. 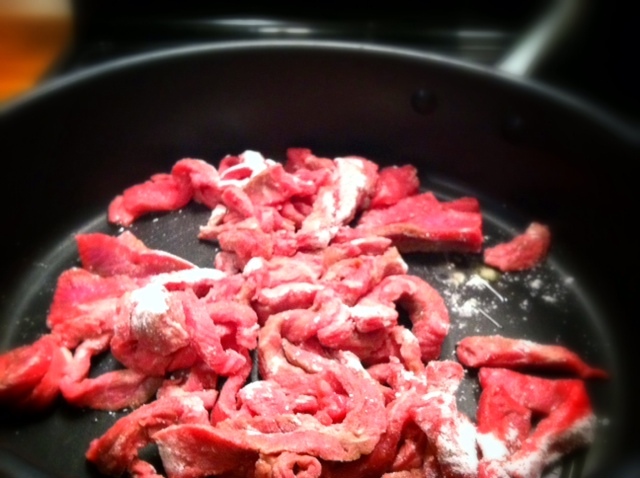 Cook sirloin 5-6 minutes or until little pinkness remains. 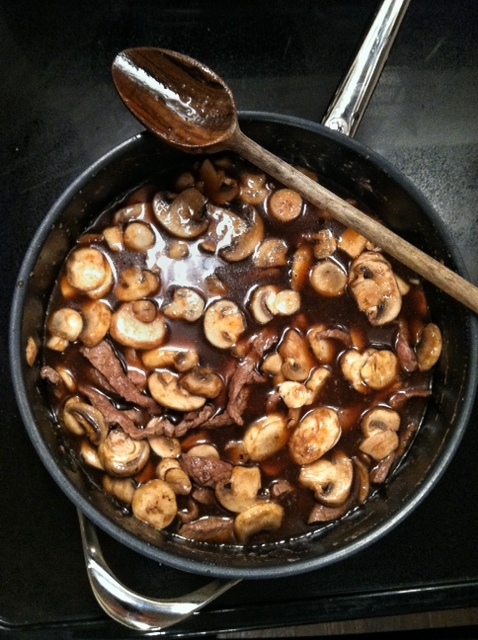 Add mushrooms and broth to pan and simmer with steak 10-15 minutes. 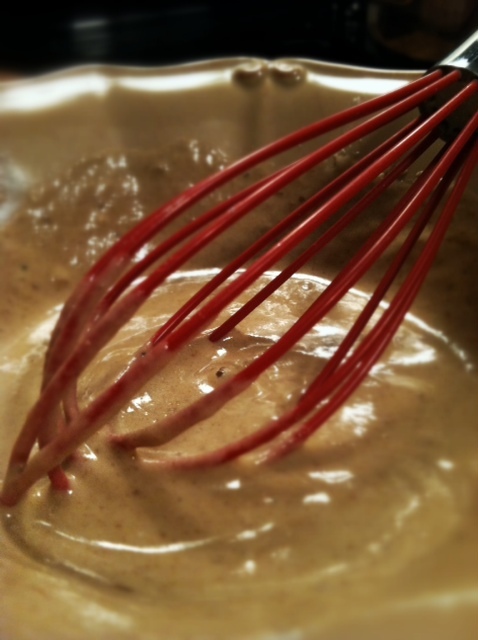 In a small bowl whisk together 3 tablespoons of flour with 1/4 cup of broth taken from the pan. Whisk until thick and smoothly combined. Add mixture back to pan and whisk until smooth. Add sour cream and whisk again. Serve over warm egg noodles. I love “weird salad”! When I was a kid we always had this salad with baked ham. I remember the weird salad since I was a kid but my mother used to make it with pear halves instead of pineapple. Still one of my favorites and I have introduced my husband and the kids to it and they love it also. Yes! How could I forget about using pears too. Also delicious! Oh my gosh!!! 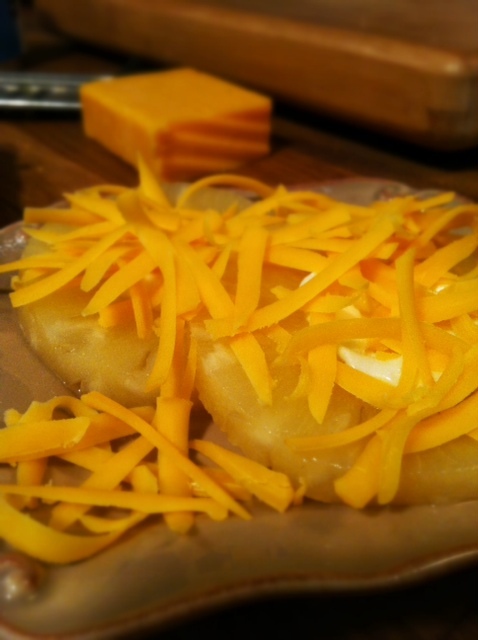 My mom grew up eating this: a leaf of lettuce, a slice of canned pear, a dollop of mayo, and shredded cheddar on top. Then she made us eat it too growing up. To this day we make fun of her for it. That is too funny! My husband has always said he thinks it is weird, but I am pretty sure it is growing on him! We have a similar “weird” salad. An ice cream scoop of cottage cheese on a lettuce leaf with a ring of pineapple broken & twisted into the shape of an S across/on top of the cottage cheese. My son called it “con-gee-po-po” because he could not say cottage cheese and pineapple. My grandmother made the “weird salad” with pears! !